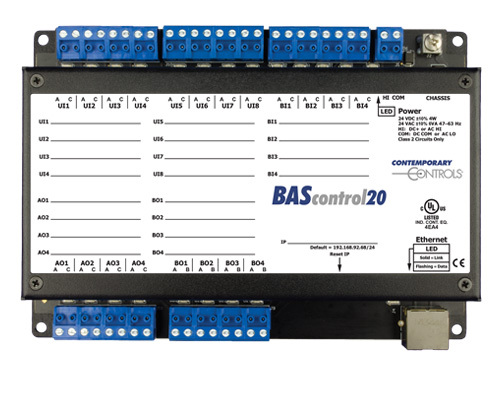 The BAScontrol20 is a 20-point unitary controller which supports BACnet/IP and Sedona using an Ethernet connection. The controller complies with the B-ASC device profile having a convenient mix of 8 universal inputs, 4 binary inputs, 4 analog outputs and 4 relay (20R) or triac (20T) outputs. Unique to the unit are 48 web components which link Sedona wire sheet readable/writeable data to web pages, and 24 virtual points which link Sedona wire sheet readable/writeable data to a BACnet client. The device is fully web page-configurable, and freely programmable using Sedona's drag-and-drop programming methodology of assembling components onto a wire sheet to create applications. The unit can be programmed using Niagara Workbench AX or a third-party Sedona programming tool such as Sedona Application Editor (SAE). Rugged design, low profile, and wide temperature operation make it suitable for indoor or outdoor use. The BAScontrol20 utilizes a powerful 32-bit ARM7 processor with 512 kB of flash memory plus a 16 Mbit serial flash file system for storing configuration data and an application program. By operating at the BACnet/IP level, the BAScontrol20 can share the same Ethernet network with supervisory controllers and operator workstations. The unit can be configured for a fixed IP address or can operate as a DHCP client receiving its IP address from a DHCP server. A real-time clock with a supercap backup allows for creating local schedules. A 10/100 Mbps Ethernet port supports protocols such as BACnet/IP, Sedona SOX, HTTP and FTP. Configuration of universal inputs and virtual points can be accomplished using web pages. Type II and type III 10 kΩ thermistor curves and a 20 kΩ thermistor curve are resident in the unit. Current inputs can be measured using external resistors. Contact closures require a voltage-free source. Binary inputs and outputs as well as analog outputs require no configuration. The unit is powered from either a 24VAC/VDC source.